LEIBER Group specializes in the design and production of lightweight metal components. The company has over 750 employees at its two locations in Europe. LEIBER works with many customers worldwide to use groundbreaking new methods to create lighter parts and products. A recent project at LEIBER required its engineers to redesign a component for a commercial vehicle. The previous part, a suspension beam, was made of cast iron. In this case, the customer required a lighter, yet equally strong new component. To design this part, LEIBER engineers used Inspire and a new material, AluXtrem®, a high tensile forgeable alloy, also developed by LEIBER. In combination, Inspire and the new material received significant lightweight results. The resulting new component was more than 50 percent lighter than the previously used cast iron component, and a lead-time reduction in manufacturing and testing enabled a more economical production process. The solution was recently awarded with the EUROPEAN ALUMNIUM AWARD. The automotive industry currently faces conflicting challenges: vehicles have to become lighter to reduce fuel consumption and CO2 emissions, yet they must be safe and reliable. In addition, manufacturers have to offer their products at competitive prices. To embrace the lightweight requirements brought upon them, new design methods and material have to be included in the development process to ensure lighter, yet stiff and safe components to contribute to the overall performance of the vehicles. Over the years, automotive vehicles have become heavier – this is mainly due to new systems that increase safety, comfort, and driving experience. This is partly due to the fact that for many years, weight reduction was not a primary development goal. The weight spiral now has to be turned around, and cars and commercial vehicles have to become lighter. Therefore, the automotive industry is seeking new approaches and methodologies in the development and manufacturing process to realize optimal lightweight structures. Design, optimization, and manufacturing of reliable lightweight components for the automotive and commercial vehicle industry. Concept generation with Inspire and the use of new materials such as AluXtrem®, a high tensile forgeable alloy. "The main reason we use Inspire is lightweight design. Inspire is extremely easy to use and delivers results incredibly quick. After only 10 minutes we already have first results and estimates. I'm always looking forward to new projects for which I can apply Inspire – it's a great tool to work with." In the past, LEIBER Group designed its lightweight components with a trial and error approach. "We would add or take away material in certain areas of the component and then do a structural analysis to see if the component would meet the criteria. With Inspire we don't have to go down this path anymore - we just define the design space, add load and boundary conditions, and the optimization produces a design that usually fits the criteria," said Uwe Kasper, design engineer at LEIBER. In a typical use case, LEIBER engineers receive an existing component from their customer. 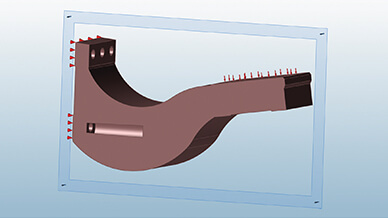 Using the existing part as a starting point, the engineers design a new geometry to substitute the former component. Another approach used by LEIBER is the creation of an entirely new component, without relying on previously created geometries. Here too, Inspire is used upfront in the project’s design process to create a new structurally efficient design. In the case of the award-winning suspension beam, the engineers used the suspension beam’s existing geometry and created a re-design. The newly designed part was required to meet the new material and manufacturing process they wanted to apply. To do so, the engineers defined a design space in which the component had to fit and researched and applied the boundary conditions such as material characteristics, fixation, loads, design/non-design space, and manufacturing constraints. With this input they then ran the optimization to generate the ideal structural part. Once the optimization was complete, the final task was to interpret the results into a production-ready CAD model. To reach desired lightweight goals, companies have to fundamentally change the way products are being developed. The traditional way includes too many iterations between design and engineering departments until an ideal design can be defined. If the initial concept was already structurally optimized in terms of load paths and material distribution, the final solution could be created in a shorter time frame and with less effort. 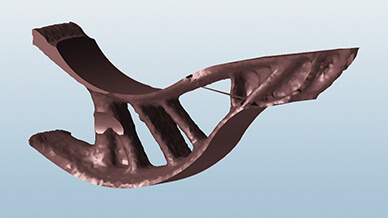 This can be made possible by including a simulation driven design process, in which simulation methods such as concept generation lead the design of new products. LEIBER embraces these methods by implementing simulation driven design with software tools such as Inspire. By using Inspire, engineers are able to create and investigate structurally efficient concepts quickly and easily. In this manner material is only used where it is actually needed and the resulting components are lighter and stiffer than most of the traditionally designed components. To further improve the component’s performance and especially its weight, LEIBER combined the simulation driven design approach with the use of new materials. LEIBER develops forgeable aluminium alloys such as AluHigh® and AluXtrem® that guarantee a high safety and strength potential and have an excellent workability in comparison to many other materials. AluXtrem® was used in the development and production of the new suspension beam. 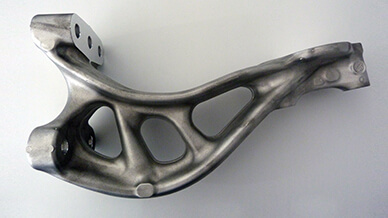 Thanks to the combination of concept generation and the new material, the new component was 50 percent lighter than the formally used cast iron component. With the new material, LEIBER was also able to shorten the manufacturing and testing process of the component leading to more economical production. In addition to weight reduction, the design process and the new material also guaranteed better fatigue characteristics of the component. Thanks to using Inspire in the design process it was also easier and faster for the engineers to create a structurally efficient design. LEIBER specializes in the manufacture of lightweight components using aluminum, magnesium and special alloys. It carries out research and development work covering all aspects of light metals and their huge technical potential. LEIBER is the only forging company to offer the complete range of services – from initial concepts and drafts to lightweight products that are ready to install. With two sites in Europe and around 750 staff, LEIBER processes approximately 14,000 tons of aluminum a year.